Native to South Asia, the mango is a favorite tropical flavor to include on fruit platters or in desserts and smoothies. And yet, many of us tend to only enjoy it when eating out. But preparing mango at home is incredibly straightforward; all it takes is a sharp knife and a craving for your favorite tropical fruit. 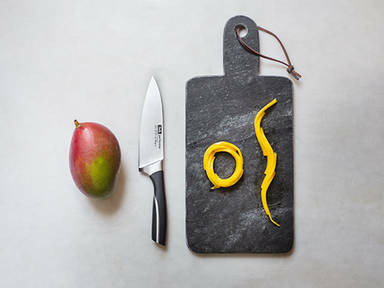 There are a couple of different ways to prepare a mango. The first way yields a more refined result. Start by peeling the fruit, then cutting the flesh from the flat, oval pit. Slice the mango thinly, then arrange the slices on a serving platter, either by fanning them out into a circle or an 'S' formation. For a more casual setting, leave the skin on. Slice the flesh from the pit, then use a knife to cut the flesh length- and cross-wise to create squares, trying not to slice through the skin. Invert the mango slice so that the squares of flesh stand up and separate from one another. You can then either use your fingers to pluck the pieces from the skin directly, or use a paring knife to cut the squares off.